When is a sequel not really a sequel? When it's directed by the amazing Takashi Miike! Boy, that Miike never makes the same movie twice! An amazingly prolific (40-50 movies and counting!) and innovative director, he continues to surprise with this, his sequel to his love-it-or-hate-it 'Dead Or Alive'. The first surprise is despite the title it has absolutely no relation to the first movie, so each can be viewed completely independently of the other. It does feature the same two main actors (Show Aikawa and Riki Takeuchi), but they are playing totally different characters. The second surprise is the movie itself, which is not only vastly different from 'Dead Or Alive', but is pretty freakin' far out in itself! But this is Miike World, and if you are even vaguely familiar with his work you know to expect the unexpected! I must admit my first viewing of 'Dead Or Alive' threw me for a loop, and I found it very difficult to come to terms with it. But a subsequent viewing and seeing 'City Of The Lost Souls' has got me more into Miike's groove, and I think helped prepare me for whatever was in store. Aikawa and Takeuchi play hitmen who grew up together as orphans. Not having seen each other since childhood they don't realise that their lives have taken similar paths until they are both hired to kill the same person. The consequence of that hit is that they both end up on the run, caught between the Yakuza and the Triads, and independently return to their childhood home, where they rekindle their friendship. After an idyllic catching up period (a section of the movie which gets it compared to Beat Takeshi's 'Sonantine', a movie it only superficially resembles), the two decide to combine forces and use their earnings as assassins for hire to help starving and sick children worldwide(!). Now this is just the half of it! To attempt to describe 'Dead Or Alive 2' is a waste of time, it has to be seen to believed! All I can say is whatever you think of Miike he is a true original and is currently doing things that NOBODY else anywhere is doing. He just doesn't play by the same set of rules as everybody else. Now sometimes this means the results aren't exactly to my taste, but I still respect him for trying to be innovative and unpredictable, and whether he succeeds or fails, I recommend his movies wholeheartedly. 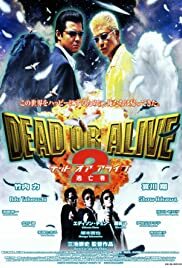 'Dead Or Alive 2' is a pretty good jumping on point for beginners (His modern horror classic 'Audition' is his most satisfying movie, but much more conventional than most of his work, so hardly representative). P.S. I loved 'Tetsuo' director Shinya Tsukamoto's cameo as an eccentric magician in the opening scenes!